I finally got my hands on a new mobile handset and am now officially authorized to brag that I own a smartphone - wow! 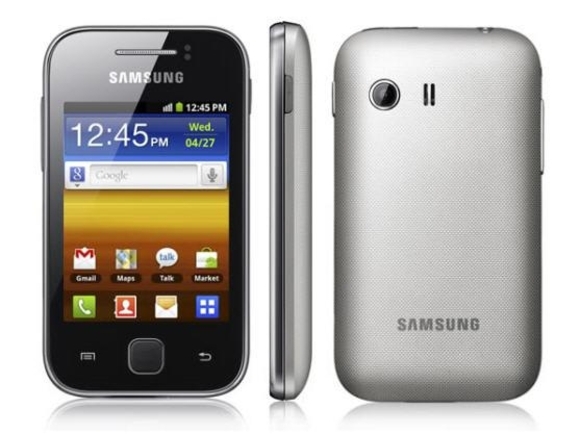 Among the three alternatives available to me in my hometown, I bought Galaxy Young which is also known as Galaxy Y in short. I was lucky to get the phone exactly as shown below because it was the last piece left of its kind and others were totally either white or black. Galaxy Pocket was almost a better alternative in terms of various parameters, but I preferred Galaxy Y owing to its slightly larger display screen and its better looking design (as shown above). The third alternative was Galaxy Y duos, and perhaps a few similar phones, which didn't run Android OS perhaps (note: if you check specifications, you will see Android v2.3 listed as its OS) and it wasn't aesthetic either as shown in the specification page! The only benefit I would have got from DUOS was a better camera and a larger display. Therefore, I chose Galaxy Y but I would be indifferent between Galaxy Pocket and Galaxy Y now because both have almost same configuration except that Galaxy Pocket has higher internal memory and smaller display size as compared to Galaxy Y. My phone runs on Android 2.3.6, i.e., Gingerbread. So far, I have used it, I have found it good and up to my expectation. Android's User Interface is smooth and it's functionality are awesome to put the whole experience in a sentence. This device is going to be handy for me to check emails and use the calendar. Apps are what make a phone more usable. The good aspect of getting an Android powered device is that you will be able to install and use a lot of apps. Even if you can't buy premium apps, you will still get a lot of free apps most of which work quite well. Furthermore, the most basic apps like that of Gmail, Yahoomail, Facebook, Google+, Twitter, and so on are free! Some, premium apps come in ad supported format for those users who can't buy one. Therefore, there are many workarounds and thanks to the Android ecosystem, you'll get to use many apps until you have an Android powered phone. Although, Galaxy Young is a low range Android device from Samsung, it is quite a boon for the people of poorer countries like mine. Its affordability is one of the reasons why it is in my hand now. Otherwise, I would have to think a bit more before buying one. Another thing that I have understood is that Android OS means a lot for low-end consumers like us. Thanks Sandip! It's not the best phone out there, mainly because of short battery life and a very simple camera! I particularly don't like duos, but if you like it then, it might be better. Otherwise, I recommend Galaxy ACE! Or you can go to other brands like LG, HTC and so on.